People gathered at the National Mall Sunday to mark the 40th anniversary of Earth Day, but at times it looked more like an "Avatar" convention. "A lush, plant-filled tent served as a replica of Avatar's Pandora, where staffers touted James Cameron's initiative to plant a million trees worldwide and reported that the director had been popping in throughout the day." 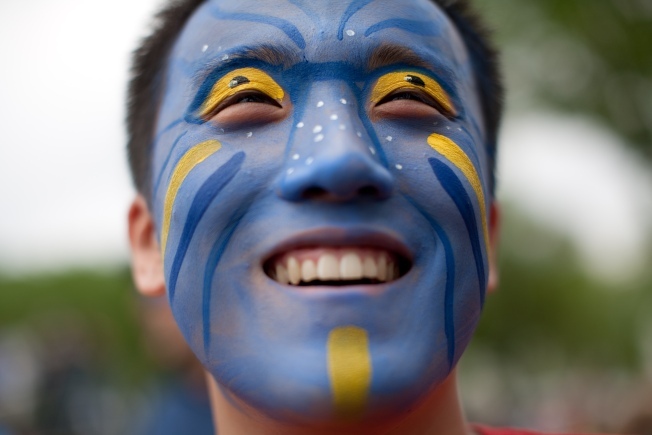 American University student Andrew Lam was caught by a Getty photographer sporting Avatar-themed facepaint at the event. But he wasn't the only one. USA Today also found Elizabeth Kesnick and experimental artist Flynn dressed as Na'vi -- complete with full-body blue paint, pointed teeth and even stilts. Despite the stilts, Kesnick danced gracefully to the music, while onlookers crowded around the pair for pictures. "The Na'vi are all about connectedness," she says. "To nature, to the earth and each other." Where's Triumph the Insult Comic Dog when you need him? Anyway, the seriousness known as the Climate Rally began at 11 a.m. Cameron and the Rev. Jesse Jackson were among the scheduled speakers. Organizers said the climate rally was intended to push Congress to pass comprehensive climate legislation. They want new laws to create jobs and cap carbon emissions. Meanwhile, Aveda Corp. and the Potomac Conservancy are marking Earth Day with a four-mile Walk for Water Monday along the National Mall. The Climate Rally was held on the National Mall as part of Earth Day celebrations. The group will start the walk Monday morning near the Lincoln Memorial reflecting pool at 10 a.m. Registration is $25. They are urging local and global leaders to take action to protect waterways, assure access to clean drinking water and promote organic farming. Proceeds from the walk will benefit the Potomac Conservancy, which works to protect the Potomac River and its tributaries.